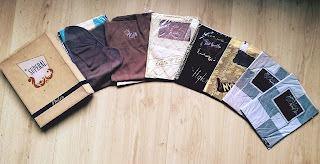 So at first I wanted to do a post on recent wardrobe additions but it turned out to be so much about hosiery that I decided to make it a stocking themed post. 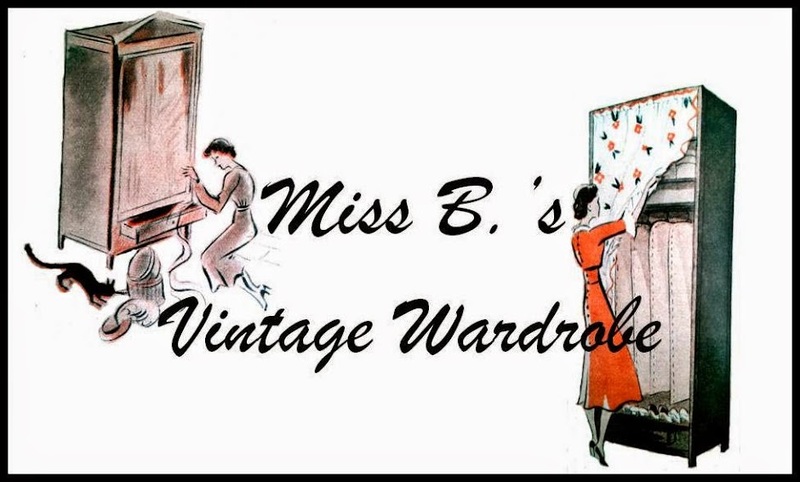 Stockings are a common 'problem' for the fulltime vintage wearing girl. I do not mean the supposed hassle with suspenderbelts, straps etc. because to me that is similar to always wearing a skirt. 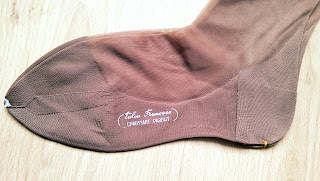 Most people think it is a nuisance but I love the feeling of wearing them. I'm talking about the problem of finding them, without spending an absolute fortune. I cannot give any guidance towards finding them, usually SHEER luck. Well I've been rather lucky and come by quite a lot of pairs recently. The best find is 4 pairs of rayon stockings. Found them yesterday at an antiques fair in Nieuwegein. 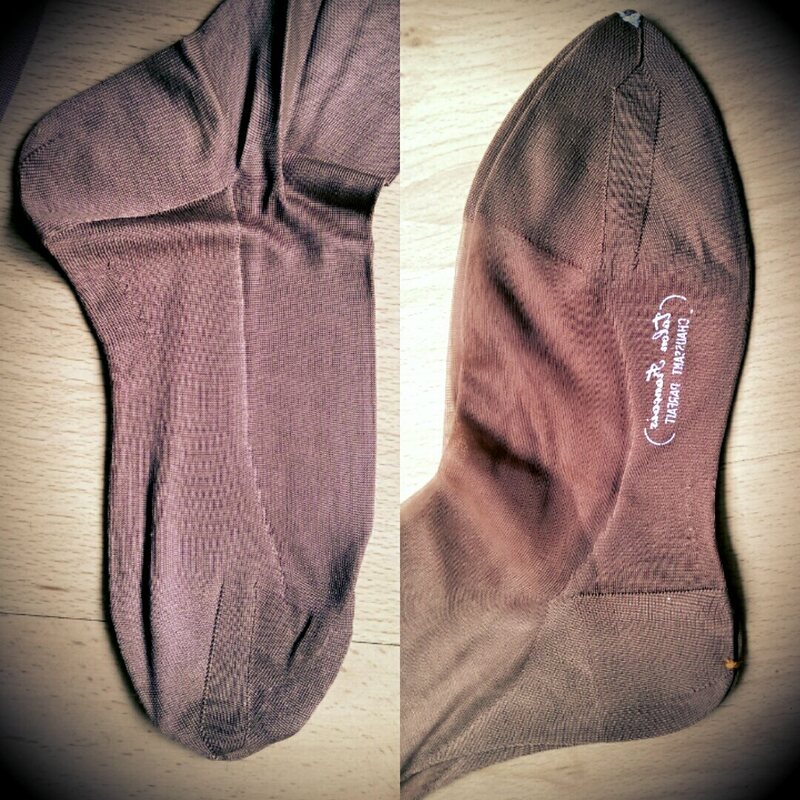 They still had the label on together with a bit of darning silk in the right color. 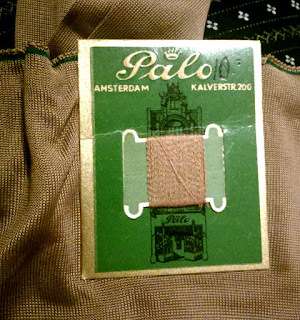 The Dutch brand Palo started at Kalverstraat 200 (one of the main shopping Streets of Amsterdam) in 1934. According to old adds they sold underwear and stockings. 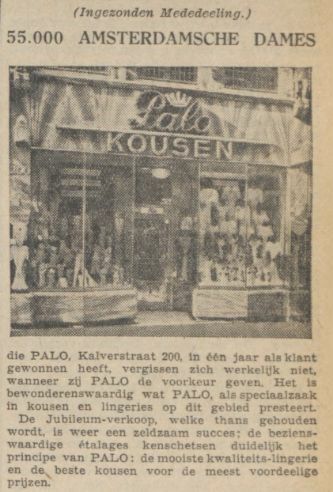 Newspaper ad of September 1934 inviting people to the opening of the shop. This ad (posing as a news report) September 1935 boasts the success of the shop, with 55.000 ladies that have become customers in a year. Palo did not close until 1970 but these stockings a very probably late 30's early 40's because of the old-fashioned spelling used on the washing instructions on the back of the label. 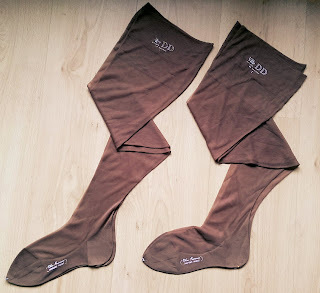 Next to stockings of natural materials as cotton, wool and silk, rayon stockings are the most authentic for a pre-1945 look but are much harder to find than nylon stockings. 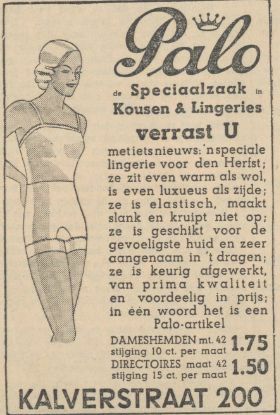 So I recently bought a lot of about 15 pairs of seamed fully fashioned nylon stockings on Marktplaats (kind of Dutch Ebay). I shared them with my friend Martine (who is more into the 50's stylewise, so they were perfect for her) so only half of it features here. 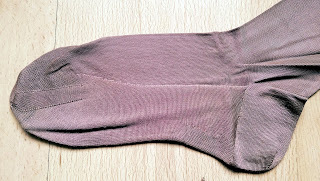 Several pairs, though made of nylon, still look quite a bit like rayon, and look the same when worn. Just look at the knitting detail in the foot. 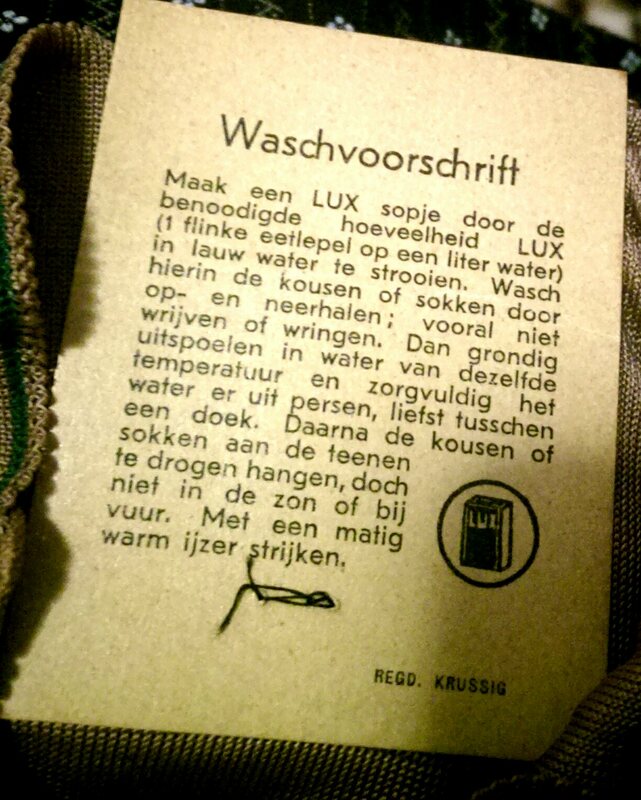 You really have to touch them to tell them apart from their rayon predecessors. 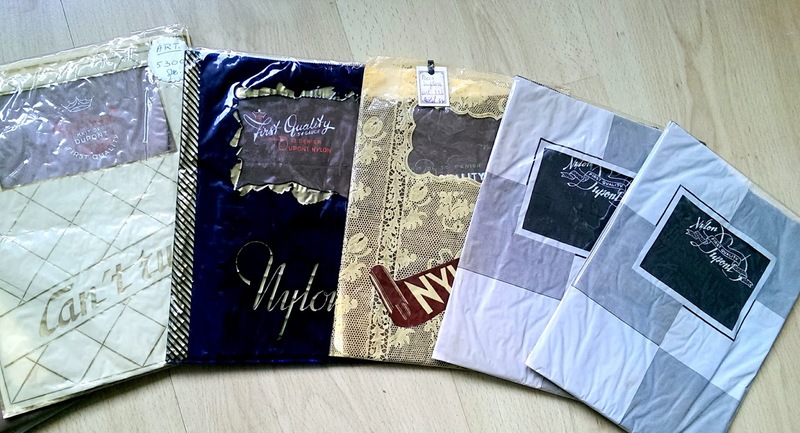 Early nylons are beautifully made, not comparable at all to most stockings you can buy nowadays. Some repro brands sell fully fashioned nylons, but the price is more than 10 times higher than what I normally pay for a vintage pair. The ones with a fake seam are cheaper (still more expensive than what I pay for vintage) but fully fashioned is what you should really want. A fully fashioned stocking is knitted in the shape of a leg, with ankle and calf. It is joined at the back with the much beloved seam, this is still done by hand I believe. These pairs also came with the same lot. I love color contrast in the heel and seam. 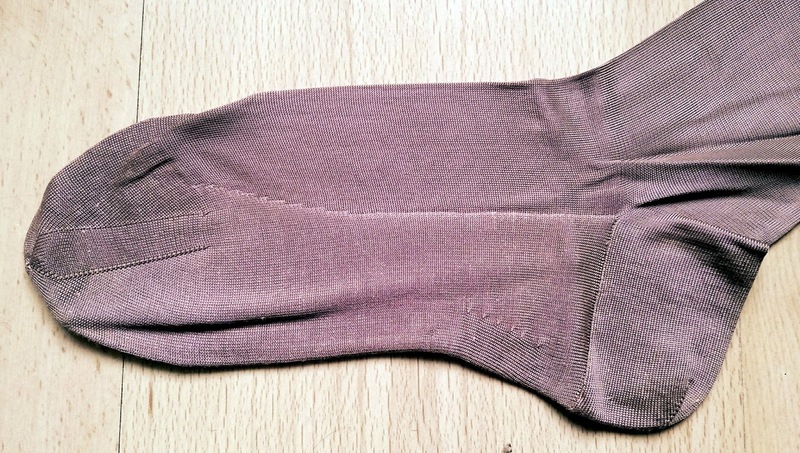 This proves that seams in a different color were around already and are not just a feature of modern repro's. Though I do not think it was common. And at the antiques fair yesterday I bought yet another lot of nylons, consisting 7 pairs. 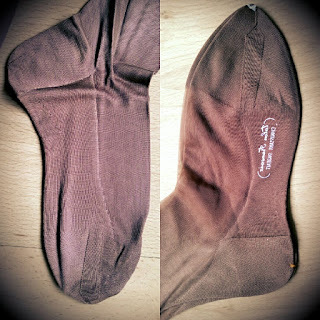 These must be the cheapest ones ever, they came at 1 euro a pair. 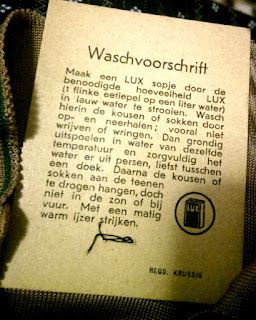 They are from the the American brand DuPont (though in another box) that first was the first to produce them in 1939/40. Women testing the strength of nylon stockings at the world fair of 1939. Because of the war, when nylon was used for parachutes, they did not really catch on until after '45. 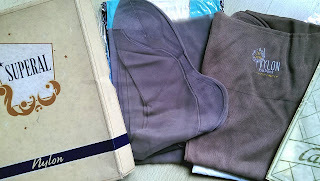 In total that makes 18 pairs of new stockings! Must be enough to see me through winter. So what material & brand of stockings do you prefer?